Parents everywhere are rejoicing as school begins again! 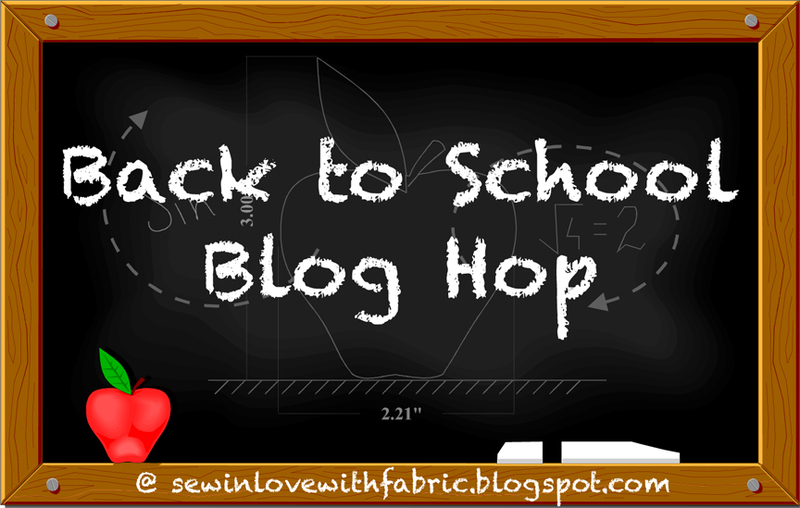 In celebration of this special time of the year, we're hosting a Back to School Blog Hop. But "back to school" isn't just for the parents of school kids...it's also for anyone heading off to college, returning to school, or even just looking for a fresh start. With that in mind we're sharing three tutorials this week (plus fabric giveaways!) that will appeal to anyone in a back-to-school mindset! Does a fun laundry bag make washing clothes more fun? The first question is up for debate, but we're going to give a resounding YES! to the second. 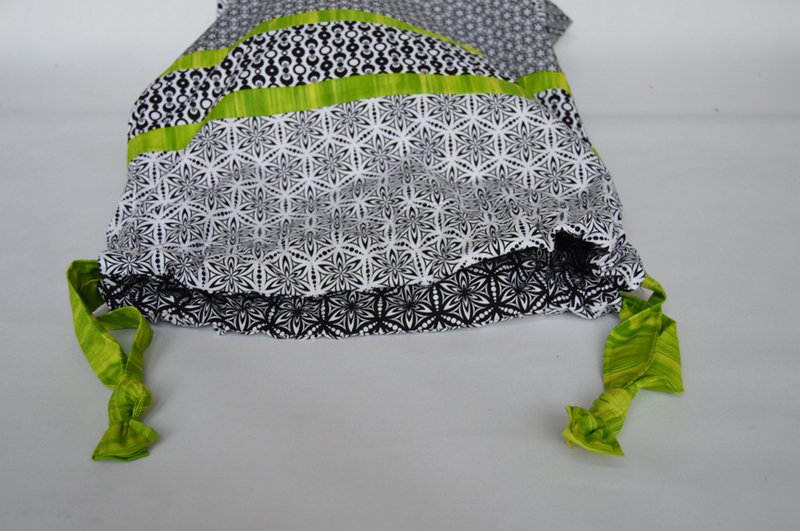 Today's tutorial is a laundry bag featuring Sarah Vedeler's Transformation Black & White prints with a pop of lime from the Fleurish collection. the black and white version will grab your attention too! 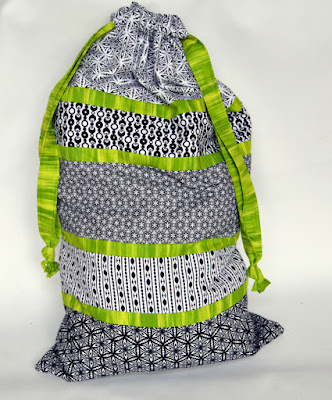 This laundry bag has it all: sturdy construction, neat fabrics, and an adjustable drawstring top. And it as one more surprising feature: an average size. Which means it can't be stuffed with a month's worth of laundry--no procrastinating means clean clothes more frequently and a happy washing machine that isn't jam-packed every time. Perfect for college students or any resident laundry fairy who needs a pick-me-up for this never-ending chore! 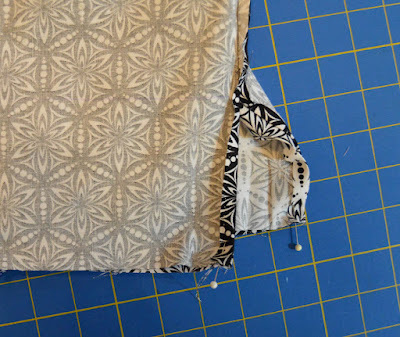 Note: This tutorial calls for using all 42" of the fabric width in an effort to use the yardage efficiently and still make the bag as wide as possible. If your fabric is not quite that wide, simply get as close to 42" as you can. As long as your pieces are all the same, the instructions will work just fine; your bag will simply be a tiny bit narrower. 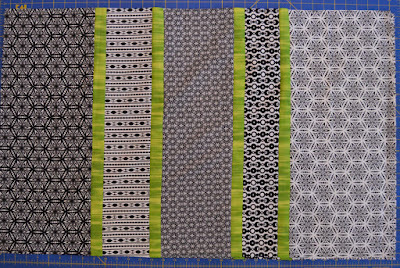 Step 1: Lay out the five various width black strips in the cutting order (and as shown below), alternating with the (4) 1-1/2" x 42" lime green strips. 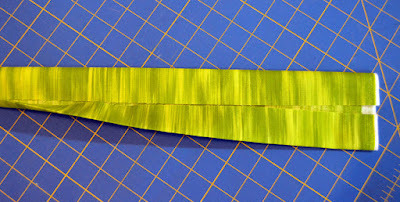 Sew the strips together to make a large panel. Step 2: Cut the panel into (2) 21" x 34-1/2" pieced units. Step 3: Lay the two pieced units right sides together with seams and raw edges matching. 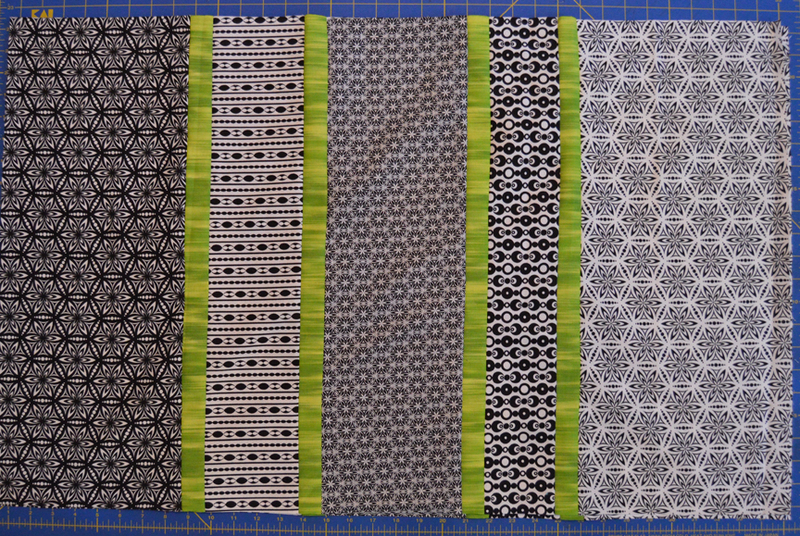 Pin along three sides, leaving the top (with the widest black #5 strip) open. Measure and mark a line 4" from the top edge (indicated in photo by pink digital lines and, if your eyes are very good, a faint marker line). Pin at these marks. Step 4: Sew around three edges of the units to create the outer bag. 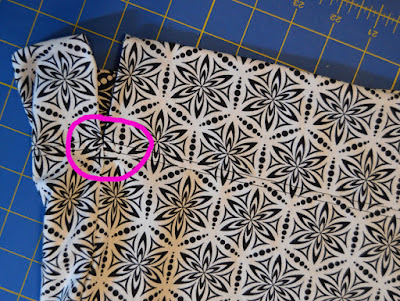 Start and stop sewing at the marked line, leaving the top 4" open. Backstitch at the beginning and end. Step 5: Press each of the raw edges of the remaining 4" in 1/4" as shown. 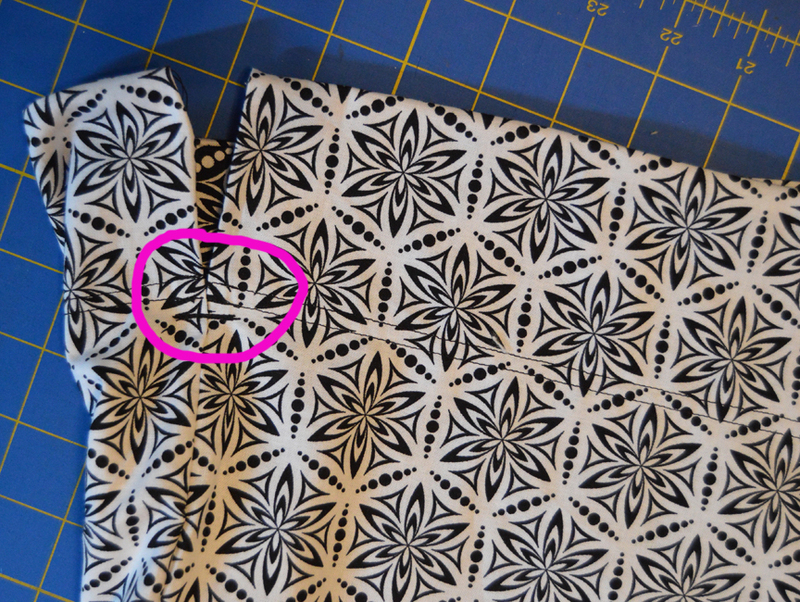 The pink line shows where the stitching stopped. Step 6: Sew the (2) 21" x 34-1/2" lining pieces right sides together on three sides, leaving one short end open for the top and leaving a 12" opening along the other short end for turning. Step 7: Turn the outer bag right side out and tuck into the lining, right sides together. Match up the top raw edges and pin in place, including matching and pinning the pressed raw edges on the side seams (see second photo below). The top 4" on either side seam will remain open when you stitch in the next step. A close-up showing the pressed edges aligned and pinned. Step 8: Sew the top pinned edges on both sides to connect the outer bag and lining. Again, make sure the 4" sections on both sides of the bag stay open. Turn the bag right side out through the lining opening. Stitch the lining opening closed and tuck inside the outer bag. Press the top edges of the bag. 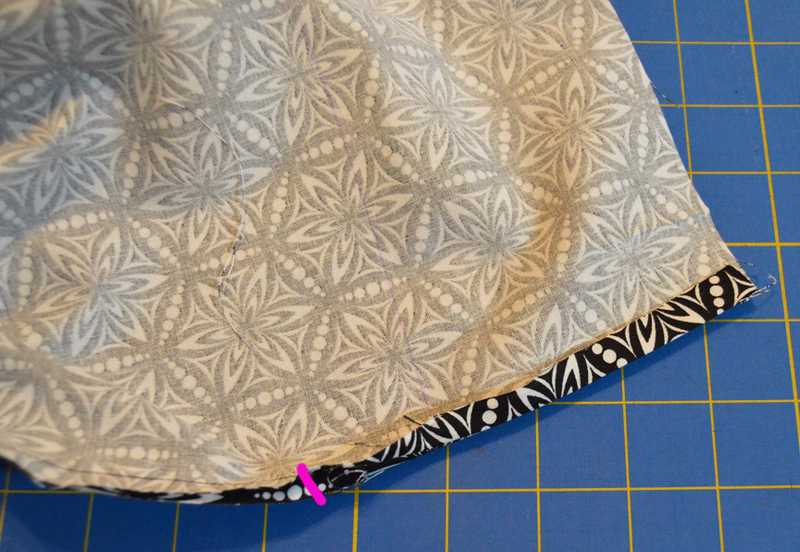 Step 9: Lay the bag flat on your mat and mark a line 3" in from the top bag edge on the lining as shown. Fold the top edge of the bag to that line and pin in place. Sew in place using a 1/4" seam to create the casing. Sew a second line 1/4" from the first for additional strength. Repeat on the opposite top edge. Step 10: Stitch back and forth just below the casing stitches where the bag splits into two pieces to secure (see spot marked with the pink circle). Repeat on opposite side. 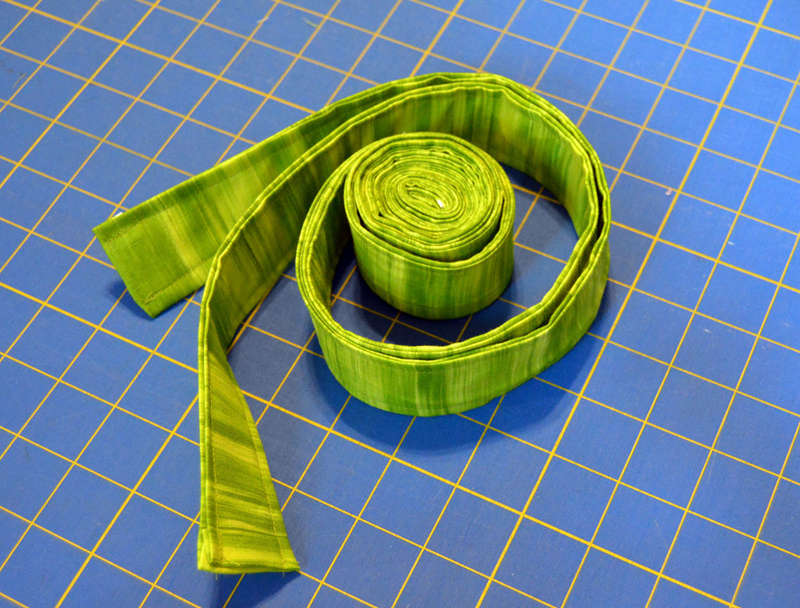 Step 11: Sew the (3) 6" x 42" lime green strips short ends together into a long strip. 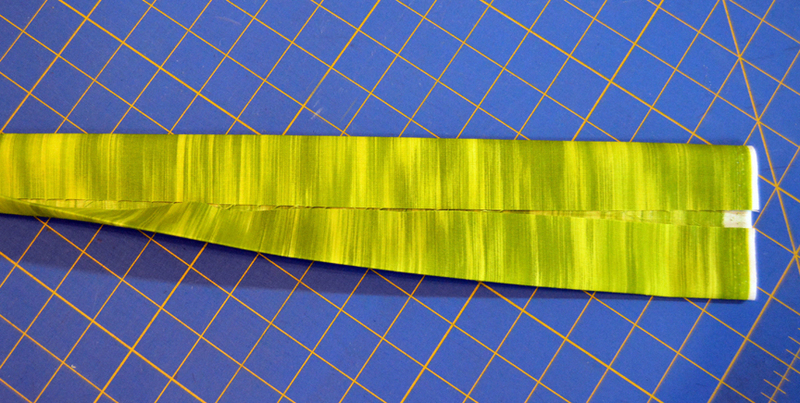 Cut this long strip in half to make 2 equal-length strips. Press each strip in half lengthwise, wrong sides together and then unfold and refold each long edge in to the center fold and press. 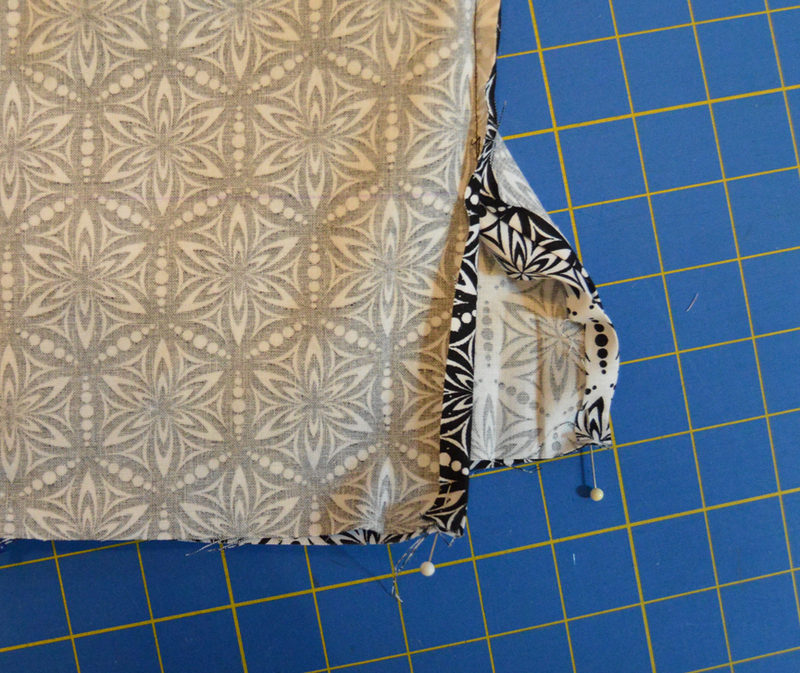 Step 12: Fold the strip again on the original center fold and topstitch down both long edges to make the drawstring. Make 2. Step 13: Using a safety pin, feed one drawstring through the front casing, beginning at the left side, passing through the opening on the right side, and back through the back casing. Tie ends to secure. Repeat with second drawstring, beginning and ending on the right side. Your laundry bag is complete! For a chance to win a FQ bundle of the Transformation Black & White collection, make sure you follow us here on the blog (options are in the right-hand sidebar). Leave a comment letting us know that you do, as well as telling us your thoughts on laundry--love it? hate it? pawn it off on someone else in the family? This giveaway is open through Tuesday, August 30th at 11:59 pm EST. We'll randomly draw a winner and announce it here on the blog. Make sure to catch all of the tutorials in our Back to School Blog Hop! I follow through blogger and actually love doing laundry. this is wonderful. thanks for the tutorial. I follow you thru email. I like doing laundry. I like clean and bright colors, not to mention the fresh clean smell. I follow by email and bloglovin! Laundry...seems like I am always doing it! :) my sister and I have competitions to see who does the most each day (she wins - three kids playing sports!!). Great bag for a student going off to school!! Thanks! I follow by email! I do not mind doing laundry at all. It is a once, maybe twice a week chore and does not take long at all. 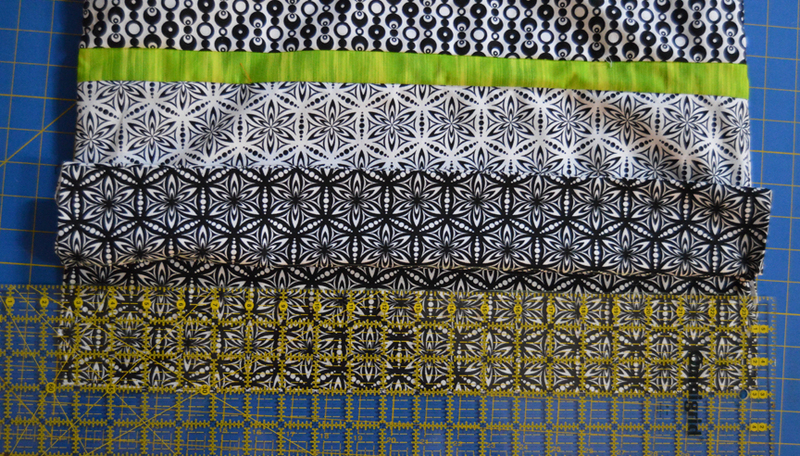 Thank you for sharing and the chance to win these lovely fabrics! Have a fantastic creative day! I follow by email. Laundry. Does not bother me at all. Must say that I am thankful that fewer and fewer clothes require ironing, although I always iron the fronts of shirts at least. 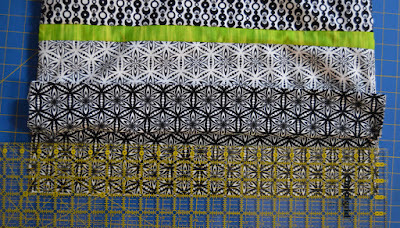 Love this beautiful line of fabrics. Ii follow by email and I think this is a great idea for a back to school present for anyone who has to carry dirty clothes. It could be for a jr high/high school sport uniform or for college actual dirty laundry to go to the washing machine. I personally HATE doing laundry and put it off as long as possible! It's even in my house but the upstairs/downstairs travel is murder on my hips. 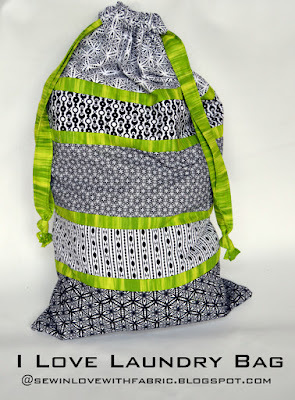 Nifty laundry bag and love the fabric! I don't mind doing laundry. Oddly, though, I enjoy laundering towels! I follow via email notification. Thanks for the opportunity to win. Very nice! I would fussy cut those fabrics. I follow you through e-mail. I love doing laundry, so does my husband. He is very meticulous, lucky me! I love the pop of green! 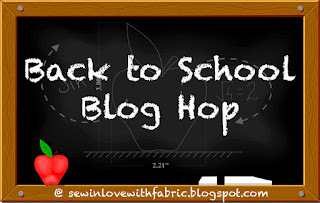 Day 2 of our Back to School Blog Hop>Thank You! 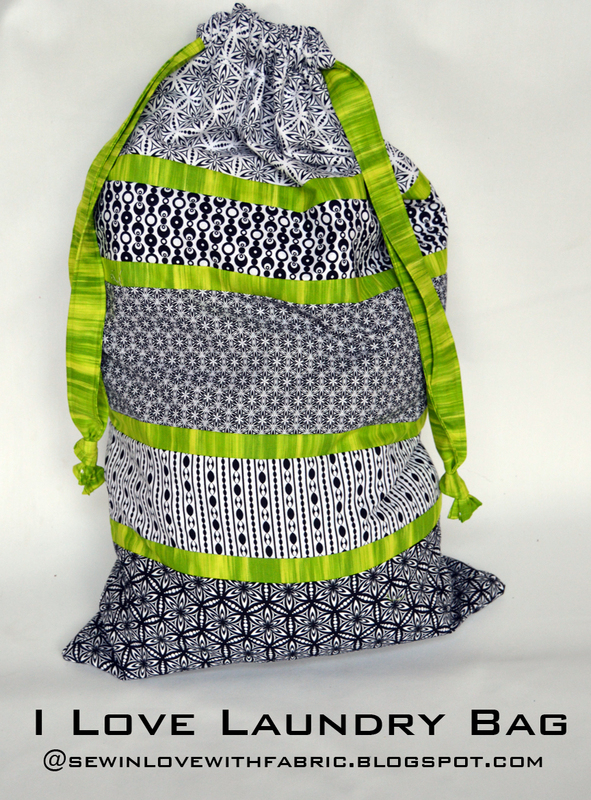 Love doing my Laundry and the smell of fresh clothing!LIKE this Bag;perfect for college kids too!Follow via gmail. I follow by email. Laundry doesn't bother me unless someone picks up all their clothes off the floor and then the pile triples overnight! I follow by email. This laundry bag will be awesome for taking camping with us, I always end up using a trash bag. Love this fabric line, thanks for the chance to win it. I follow on Bloglovin' and email as well. Laundry--well, it is something I do when I can't decide what else to do. I usually have a bunch of things to do, and need to "think" about them to get them in order, so at least something gets done. Do love those black and white fabrics. 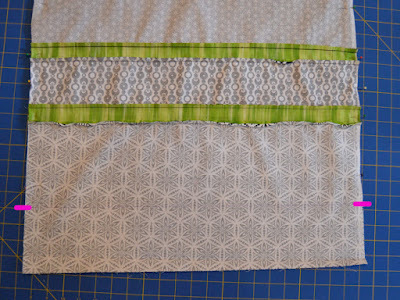 This project, with the right measurements, would make a cute pillow case as well. I follow your blog through Blog Lovin. Laundry is usually done by my husband, but I pitch in occasionally. He's better at it than I am! Into the washer, into the drier, but during Summer onto the line! Laundry is an almost daily ritual, with two young kids. I follow your Blog. My husband does the laundry, I cannot get up the steps. Good excuse, right? Ooh that lime green is like a shock wave amidst the black and white. Thanks for the tutorial, it's something I can certainly whip up in no time. As for laundry, don't mind that duty at all. I follow Sew in Love w/Fabric via email. THank you. 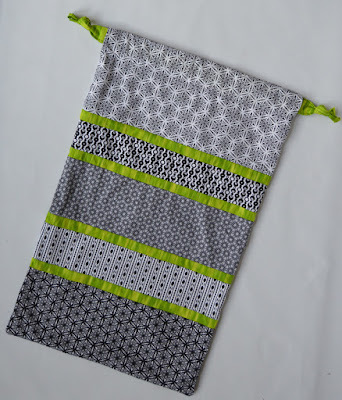 Great idea to make a pretty laundry bag! It will be perfect for taking vacations and much better than throwing everything into a garbage bag. I am a Bloglovin' follower. I do all of the laundry here and don't mind it a bit. I also like to hang it outside on the line in nice weather! What I hate is dusting and ironing. Ugh. I follow the blog with email and gfc. I don't mind doing the laundry. But it seems to take forever as I usually forget I'm doing it when I am in the basement sewing. I follow your blog through email and BlogLovin. I think this laundry bag could also be used to put large size gifts in at Christmas...just change up the fabric. I follow via Bloglovin. Laundry is the only housekeeping chore I actually like. I never let laundry pile up! Question about the tutorial .. do you leave the same 4" gap on the lining as you do on the outer, or do you sew the side seam all the way to the top on the lining? 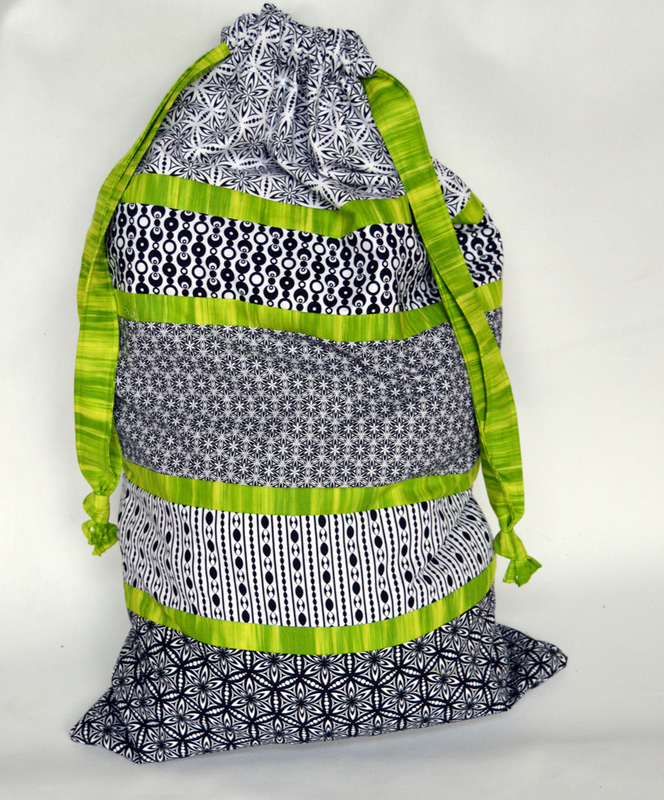 Love the fabric combo.Pretty nice bag and great tutorial.I love doing my laundry . I do follow the blog by email. I made a laundry bag when I was 12, just had it to hide my laundry! 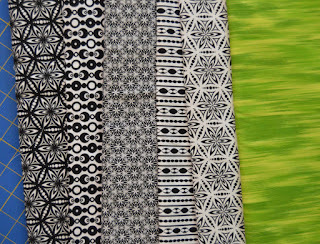 I follow by email, and love that black, white, lime color combo! I do laundry because it has to be done and no one else will do it! I follow via email. Laundry - I don't mind doing it. Since my husband retired and restores old cars in his spare time, he has started doing his dirty greasy clothes. Sure makes it much easier for me. I follow you via email. Laundry is something that needs to be done, no getting around it. I'm a follower! 😀 Laundry...well it always needs to be done, I don't mind doing it! I follow you by email. and I hate doing laundry! I don't mind doing laundry. The washer and dryer are near the quilting machine so I can often do the laundry while quilting. Your laundry bag is cuter than any I've seen before! I follow on my blogger dashboard/GFC. Sarah Vedeler's Transformation Black & White prints are awesome! I share the laundry chores with my husband. He washes, I fold and put away! I'm an e-mail subscriber! I follow via email. I don't mind doing laundry, but I dislike ironing it! I love the bag, it might even make ironing more enjoyable. 😊 Thanks for the giveaway. I follow your blog via bloglovin'. As for laundry, I don't mind washing and drying, it's the folding that I loathe. Love your pick of fabrics! The pop of lime green is neat! I don't mind doing laundry. I love folding the clothes when they're first out of the dryer. I'm a follower of your blog via email and BlogLovin. This is a,great tutorial and those fabrics are incredible! I don't mind doing laundry with the exception of sheets!! I hate when the pillowcases or flat sheets get stuck in the elastic corners of the fitted sheet!! Ugh!!! I do follow your blog via email!! Thanks!!! 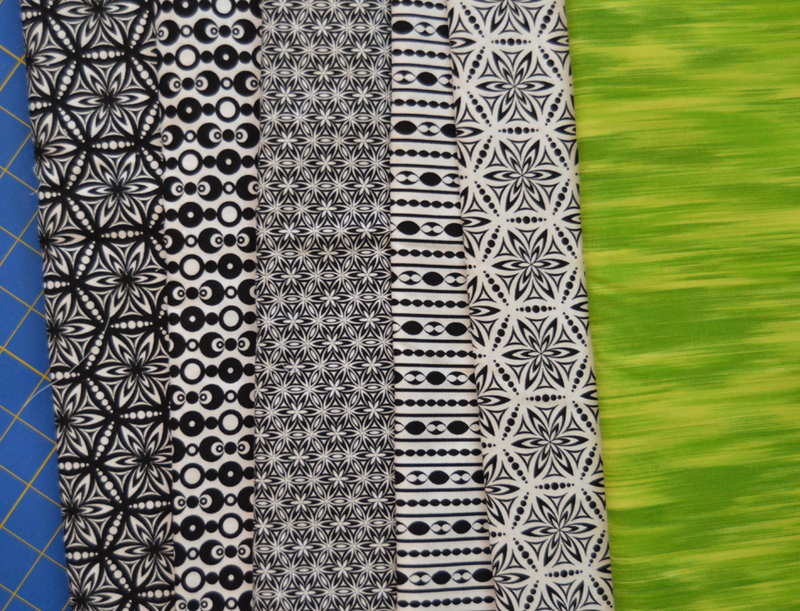 I've been collecting black and white fabrics. These would be a great addition. I follow by email. I do all the laundry. My husband can't be trusted and leaves the clothes to wrinkle in the dryer. I follow on Email & Bloglovin :) I don't mind doing laundry...love making it all clean & fresh! Specially looove hanging things on the line on a sunny breezy day! I follow on feedly and gfc. I don't care for it and will pawn it off on my husband when I can. 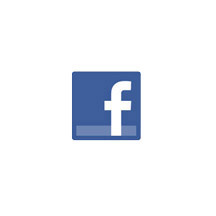 I follow by email & on Facebook. I don't mind doing laundry now that it is just my husband & myself to do it for. If I recall correctly, I think it was a bigger deal when we had our 3 children at home--especially when I had diapers to do! I follow w/ bloglovn this blog! 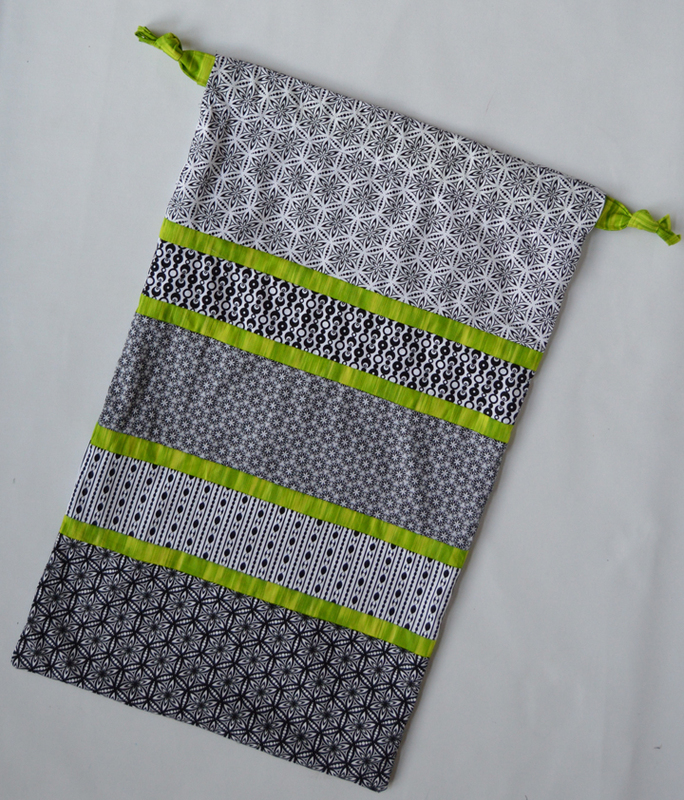 I do not mind laundry - and your tutorial for the bag is great! thank you! I like the colors of the fabrics. I don't like to do laundry. I leave it to my hubby if I am too tired with housework. And my thoughts on laundry? Well, I am not thrilled to do it regardless, but I am always happy when it is finished. I follow on Bloglovin and I like to do laundry in the summer and hang it outside on the clothesline to dry. Thanks! I follow your blog via email, and laundry is just necessary. I don't love or hate it, I'm just thankful to not be wearing stinky clothes. Love the colors and the bag seems perfect for travel. Laundry is actually my favorite household chore. Thanks for the great tutorial and giveaway. I'd love to win this one. I follow this blog via Bloglovin. I love black and white fabrics with a pop of color. Classic. Laundry is a necessary part of life for me so I make it as painless as I can. Everything I use for laundry is either unscented or green recyclable. I have colorful wicker clothes baskets that I use also. I follow the Benartex blog via blogspot, the Facebook page and get the Mr b's preview packs. I don't mind doing laundry; it's the only time my clothes are neatly folded. What fun! Who would have thunk it! Thanks Much! I am a follower. Laundry is like dusting you just do it everyday. I have no one to assign it to just the two of us now. I am a follower on email and blogovin. I follow via email. The laundry is done by my husband.... Not my favorite thing. Fun idea, and the pop of lime is great. I do enjoy doing laundry. I'm a pro at getting out stains, so the results are good. The only thing I don't like is putting it all away. I follow via email. I follow via email. I don't mind doing laundry and especially love smelling freshly laundered anything! I don't even mind getting things out of the dryer and folding them----it's the "putting away" I hate to do! I follow by email and a laundry bag is great to take on vacation.